Ulysses S. Grant fought to take Vicksburg, Mississippi to control the Mississippi River. The campaign lasted from May to July in 1863. Vicksburg had high levels and armed soldiers could control river traffic very easily. In July of 1863, Grant took the area. Gettysburg and Vicksburg cost the South much of its manpower. Lincoln made Ulysses S. Grant the commander of the Union. Grant appointed General William Sherman to serve under him. Sherman marched on the South and utterly devastated and destroyed various areas with fire, including Atlanta. He wanted to pursue severe tactics to force the South to surrender. Many were upset with the war’s length and did not want Lincoln reelected. However, news of William Sherman’s victories began to spread around the Union. As the North gained ground, Lincoln’s popularity went back up. Lincoln won the election of 1864 against his former general, George McClellan, who represented the Democrats. Grant initiated an invasion of Northern Virginia called the Overland Campaign in May of 1864. The capital of the Confederacy, Richmond, fell to the Union on April 3rd, 1865. The Confederates surrendered at Appomattox, Virginia on April 9th, 1865.The Civil War was over and the North emerged victorious over the rebellion of the South. 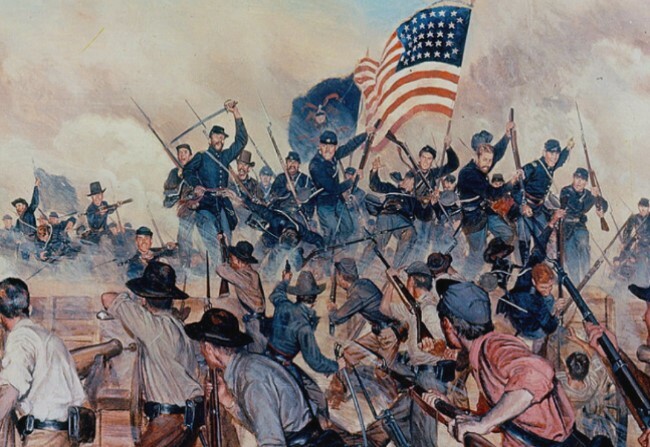 Approximately 365,000 Union soldiers died and 260,000 Confederate soldiers died. The federal government emerged more powerful. Northern states saw a boom in economic activity. Southern states had their economy crash. Slavery was eventually abolished. The Emancipation Proclamation did NOT effectively free ALL slaves; Border States still had slaves. However, the 13th Amendment eventually freed ALL slaves and was a direct result of the war. Lincoln had plans to reunify the Union. He did NOT want to severely punish the South. Lincoln believed a lenient approach was the only way the nation could move forward in peace. On April 14, 1865, John Wilkes Booth assassinated Lincoln at Ford’s Theatre in Washington. Booth was killed later by Union soldiers in Virginia. *Most of our plans include the contents of this list. Some however feature study guides, assessments or alternative assignments. 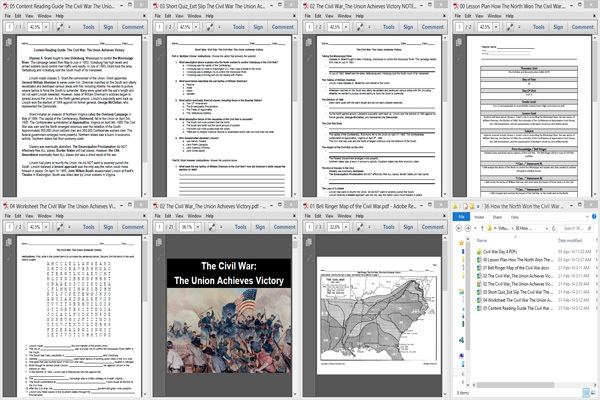 Please see the photo above for images of what is inside this lesson plan. Thanks!